This 1970s building is near the Burton Village housing complex, and offers 3 floors of office space. There's lots of on-site parking, and the rent includes everything apart from business rates and IT/Telco. 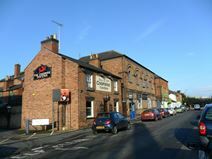 The office space is just 10 minutes on foot from the centre of town and the train station. This centre is in an excellent location in the heart of Burton on Trent. Just a few minutes from the railway station, these former Brewery Stores have undergone extensive refurbishment and offer a range of office solutions to suit your needs. Offices and light storage units are offered for rent in an excellent location close to public transport. The rent is inclusive of most rates and utilities and parking is available on-site. This centre is in a peaceful residential location at the edge of Burton on Trent. Easy to access, with lovely sea views, this former Police Station has undergone considerable refurbishment to provide a range of office solutions.